I agree about primitives, and global search/replace. Those would be very useful. Blitting the bitmap on screen with mirrored or rotated (by 90/180/270 degrees) direction. That would save rom also. 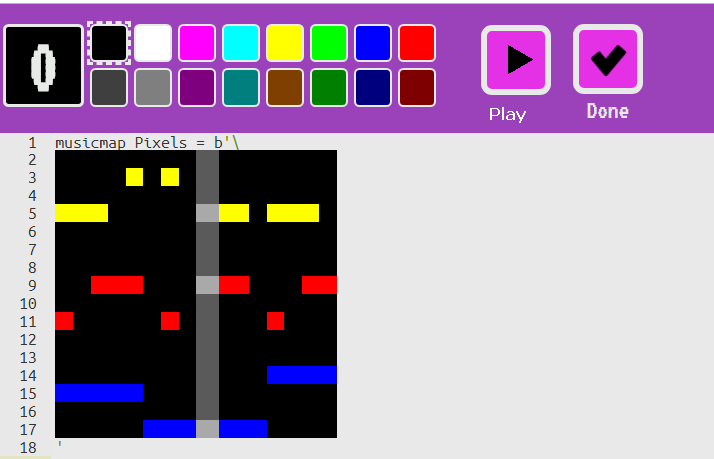 That would be a simplified version of the above and using the same “Sprite” editor feature as bitmaps and tilemaps. In addition, this “musicmap” editor would have a same kind of rolling cursor that, if the play button has been pressed, would continuously play the notes of the active musicmap as you edit it. The GUI looks like a prototype, should be polished a bit, for example I’d change the fixed-width font for something more clean (except for the code editor of course). I agree that some UI polish would be needed, but not many are good in that (me included). It would be great if you care to draw a mockup of your suggestions. I tried to style the page a little but apparently I’m not that great at it either I have some free time tonight though, so I’ll send any results if I manage to succeed. Is there an easy way to transfer the color palette of the code project to piskel?